A "t+" (paper) ticket should be inserted into the first slot of a métro or RER station turnstile; it will be returned to you from a second slot (buses have a similar mechanism on board). Be sure to keep your ticket with you until you have exited the station at your destination; conductors will sometimes perform spot checks. Mobilis and Paris Visite passes come with a plastic sleeve in which to keep both the card and the ticket (fr. coupon) – which is the same size as a regular "t+" ticket, but a little more durable. When entering a métro or RER station, simply remove the ticket from its sleeve and insert it into the slot on a turnstile. The ticket will be returned to you from a second slot; replace it into its sleeve and pass through the turnstile. (Note: the ticket is also required in order to exit from RER stations.) When boarding on a bus, however, simply show your pass to the driver; do not insert the ticket into the machine on a bus, as this will invalidate it! The NaviGo smart cards – issued for Carte Améthyste (senior citizen, handicapped, military veteran pass), Carte Intégrale (annual adult commuter pass), Passe Navigo (weekly or monthly pass for residents & visitors), and Imagine "R" (student pass) – should be waved within a few centimeters across the purple sensor installed on all platform turnstiles. Métro trains run from 5:30 a.m. to approximately 12:45 or 1:00 a.m. on weekdays (this varies, so don't push your luck), at which point they are brought to various depots for daily cleaning and maintenance. Saturday night service (actually early Sunday morning, as it is after midnight) has been extended by an extra hour. On New Year's Eve and during the Fête de la Musique (Music Festival) in June, some lines will run for 24 hours. You'll know whether you caught the last train for the night, if you see that the two lights placed above the windshield on the front of the train are flashing slowly (as opposed to just being on) when it pulls into the station. rehabilitating the roadbed of a viaduct. While the Paris rail system is among the most reliable in the world, it is not immune to occasional service interruptions during regular working hours – due to accidents, mechanical breakdowns, railway construction, or station renovations. Fortunately, the RATP helps you to plan ahead for most contingencies by posting closures and traffic delays online (in French only). The traffic report advises of line closures or delays due to unforeseen circumstances; in certain cases, RATP will provide métro riders with bus service to circumvent a problem area. The construction report offers information on temporary station closures caused by rail repair or renovation projects. Considering the sheer number of commuters and tourists who travel on the Métro system – estimated at about 6 million people daily – the RATP manages to maintain an excellent overall safety record. Since the system's inauguration in 1900, fires appear to have been the most common causes of injuries and fatalities. Terrorist attacks which remind one of those which occurred in Madrid, Spain (2004); London, England (2005); and Mumbai, India (2006, 2008) had also been launched earlier on transportation equipment in Paris and Lyon, albeit with a much lower death toll. A rash of incidents occurred between 1995 and 1996, which sparked a restart of France's national Plan Vigipirate security alert system. If you know of any other Paris Métro accidents or incidents that should be listed here, we would appreciate if you could describe them. Thank you. * According to an FBI terrorism consultant, some of the money used to finance the 1995 bombings came from people connected to the Brandbergen Mosque in Haninge, Sweden. If you happen to be out after the Métro system shuts down, and you're across town from your lodgings, the Noctilien nighttime bus service can get you closer to your destination. Effective September 20, 2005, Noctilien replaced the old Noctambus system – more than doubling its number of routes and the total kilometers covered by the network. While the former 18 Noctambus routes emanated from one central hub at place du Châtelet, the 47 current Noctilien routes run from five different hubs: Gare de l'Est, Gare de Lyon, Gare Montparnasse, Gare Saint-Lazare, and Châtelet. Running from 12:30 to 5:30 a.m. – 7 days a week, 365 days a year – the service covers Paris and more than 200 communities throughout Ile-de-France with over 2,000 stops, including routes to Charles de Gaulle and Orly airports. Noctilien serves 8.4 million passengers annually. The frequency of Noctilien buses varies according to the route and the day of the week (extra service is offered on Saturday and Sunday mornings). Various passes are honored for travel, including the Navigo, Imagine R, Intégrale, Mobilis, and Paris Visite. If you don't have one of these passes, individual tickets may be purchased on board (€2.00 each) – though the drivers do not sell carnets of 10 tickets, which are only available from ticket agents in stations or at approved retail locations. The number of tickets required for your particular passage is equal to the number of zones (1-5) you traverse on the route, after the first two zones; find examples of typical fares on the Noctilien web site. Connecting with a different bus also requires a new fare. For more information, or to ascertain departure times for your route, you can call 08.92.68.77.14 (0.34 euro/minute). Two "circular" Noctilien routes, N01 and N02, are currently accessible to passengers with reduced mobility; there are plans to provide similar accessibility on other routes in the near future. For further information, please visit www.infomobi.com (in French only), send an e-mail inquiry to contacts@infomobi.com, or call 08.10.64.64.64 from a local land line (not a mobile phone) – Mon. to Fri., 7:00 a.m. - 7:00 p.m. or Sat., 9:00 a.m. - 5:00 p.m.
For nighttime travel, you can also try hailing a cab, either on the street or from the 745 taxi ranks around Paris and the suburbs. 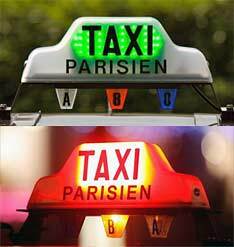 Look for the large "Taxi Parisien" rooftop light – if it's green, the cab's available; if it's red, the cab is engaged. A glowing letter below it (A, B, or C) indicates the type of fare. Green and red Taxi Parisien rooftop lights. Licensed Parisian taxis can be all shapes and sizes, makes or models (but must have working meters and appropriate rooftop lights). The city has recently recommended that all taxi roofs be painted black for uniformity, but this has not yet been universally adopted. Overnight rates (for 1 to 3 passengers) are €1.17 per kilometer within the city (Mon. - Sat., 5 p.m. - 10 a.m.), €1.42/km to the suburbs (Mon. - Sat., 7 p.m. - 7 a.m.); Sunday rates between midnight - 7 a.m. are €1.42/km to all destinations. There is a supplemental charge of €3.00 for each additional person over 3, and €1.00 for each piece of luggage after the first (weighing in excess of 5kg and placed in the luggage compartment). The minimum total fare for a taxi (including extras) is €6.20. Keep in mind that if you phone ahead for a taxi, the amount showing on the meter upon its arrival will reflect the distance it traveled to get to your pick-up point from its previous location. Do not be surprised if that amount is already €7 (or more) when you board. The Paris Convention & Visitors Bureau publishes a useful 5-page guide (PDF, in English), which explains taxi rules & regulations, provides cautionary notes about avoiding unlicensed taxis, and offers phone numbers for all the leading taxi companies. Some of the Paris Métro lines run over-ground for short periods. Line 6 near La Motte-Picquet allows a good view of the Seine, the Eiffel Tower and the Trocadéro. Line 7 near Pont-Marie looks across the Ile de la Cité, most striking at night when Notre Dame is lit up. A small number of métro stations have been closed or abandoned over the years, mainly because they were too closely spaced near other stations. The Saint-Martin stop is an example, as it was situated very near to Strasbourg–St-Denis, and therefore deemed unnecessary; it has been closed since September 1939. There are a number of unofficial – non-RATP – web sites devoted to documenting such "ghost" stations (see related links). In a humanitarian move, the RATP and the City of Paris have collaborated to help the homeless (SDF, sans domicile fixe) population by creating shelters in some of these abandoned stations during the coldest winter months – although it was also a matter of political expediency, aimed at reducing incidences of homeless who had been camping in the public stations. * The word 'boulevard' is derived from the German 'bulwark' which means the top of a fortification. Cinema apparently loves the RATP. The vast majority of directors and screenwriters who set their films in Paris shoot scenes on the city's public transport. According to sources, from 50 to 70 short and full-length films are shot in the RATP's networks each year (including métro, bus, tramway, and RER). In the 1965 Alex Joffé film La grosse caisse – released as The Big Swag in English – the French singer and actor André Bourvil plays a métro station manager (Louis Bourdin) who dreams of holding up the train that collects the RATP's cash receipts at the end of each day. Alain Delon plays a lone hired murderer (Jef Costello) engaged in an impressive manhunt set in the Paris Métro, in the 1967 Jean-Pierre Melville film Le Samuraï. In the 1975 Henri Verneuil film Peur sur la ville – released as Fear Over the City or The Night Caller in English – Jean-Paul Belmondo (as Commissaire Letellier) executes one of his most famous stunts, running on the rooftop of a métro train at the Auber station in pursuit of a serial killer named Minos. See photo. On the American sitcom Two and a Half Men (season 8 finale), the show's main character Charlie Harper (Charlie Sheen) dies after "slipping" off a Paris Métro station platform and being struck by an oncoming train. In the season 9 premiere, Charlie's family suspects that his new wife Rose (Melanie Lynskey) had pushed him in front of the train, after discovering him in the shower with another woman. At the funeral, Rose said, "I just want you to know that Charlie didn't suffer. His body just exploded like a balloon full of meat." In the 1985 Luc Besson film Subway, Fred (Christopher Lambert) is pursued by henchmen of a shady businessman and takes refuge in the conduits of the Paris Métro, where he encounters a subterranean society of eccentric characters and petty criminals, including a rollerskating bag-snatcher. Fred survives on whatever he can scam or steal, yet finds the time to romance Héléna (Isabelle Adjani) and conjure up a rock band with buskers who play in the Métro's corridors. Jean-Pierre Jeunet's 2001 blockbuster romantic comedy and international hit Amélie (original French title: Le fabuleux destin d'Amélie Poulain) immortalized the Porte des Lilas¹ métro station, which is used as the Abbesses (Montmartre) station for the purposes of the movie. Julie Depardieu, as prostitute-turned-covert agent Jeanne Faussier, is seen on the Concorde station's platform (actually filmed at Porte des Lilas¹) while a Sprague-Thomson line 1 métro train arrives in Jean-Paul Salomé's 2008 film Femmes de l'ombre (released in English as Female Agents), an historical drama set in World War II. See photo. Part of the 2010 film The Tourist (starring Angelina Jolie, Johnny Depp) was filmed in the Quatre-Septembre station of the Paris Métro (line 3). The Tourist is a remake of the 2005 French action film Anthony Zimmer. Porte des Lilas – Cinéma is a station which was originally built for a shuttle from line 3bis to line 7's Pré-St-Gervais that was never commissioned. Instead, the station has gained a new lease on life as a movie location-for-hire, from which the RATP earns an estimated €200,000 annually (about €15,000-18,000 per film). Reminiscent of Hans Rudolf "Ruedi" Giger (born 1940), a Swiss surrealist painter, sculptor, and set designer – best known for nightmarish biomechanical imagery. Those of you who are dying to take home a souvenir of your travels on the Paris Métro may be disappointed to learn that the RATP Boutique, formerly situated near the exit for Place Carrée and the Line 4 interchange at the Châtelet - Les Halles RER complex, has been closed for several years now. However, memorabilia dedicated to all manner of Paris train and bus topics – such as t-shirts, keychains, postcards, coasters, maps, cups, pens, watches, books, etc. – can be found near assorted monuments and at retailers around Paris: Notre-Dame, Sacré-Coeur, the shops on rue de Rivoli (near the Louvre Museum), L'Univers de Léo (near Pompidou Center), Eva Baz'Art (Île Saint-Louis), Souvenirs de Paris shops in some métro stations (incl. Trocadéro), and at the Galeries Lafayette (tourist dept., 5th floor). Author: Ian C. Mills ©1998- – All Rights Reserved. Sources: Régie Autonome des Transports Parisiens (RATP), the public transportation authority for Paris. Paris Métro, Alexandre Polozoff 1998 (web site). Paris: The Rough Guide (6th Ed. ), Kate Baillie, 1997, Rough Guides, The Penguin Group. Exploring Paris, Fiona Dunlop, Fodor's Travel Publications, Inc., New York. The Real Guide - Paris (Revised), Kate Baillie & Tim Salmon, 1992, Prentice Hall, division of Simon & Schuster Inc., New York (out-of-print). The TimeOut Paris Guide (2nd Edition), Penguin Books USA Inc., New York (out-of-print). The Summer of WiFi, an article by Gareth Spence (3 July 2012). Images: Wooden métro cars, © Guillaume Potier, from Le Métro Parisien (unofficial web site). Model B161 wooden métro trailer (non-motorized) cars placed in service July, 1900, on exhibit at the Association pour le Musée des Transports Urbains, Interurbains et Ruraux (AMTUIR), photographer: Gonioul (real name unknown; 15 September 2007), from Wikimedia Commons. Model MM1 wooden métro motor car placed in service July, 1900, on exhibit at the Association pour le Musée des Transports Urbains, Interurbains et Ruraux (AMTUIR), photographer: Gonioul (real name unknown; 15 September 2007), from Wikimedia Commons. War memorial in Richelieu-Drouot station (métro line 8), photo by Clicsouris (real name unknown; October 2008), contributor to the French Wikipedia. Arts et Métiers station platforms, photographer: Carlton (full name unknown; May 2004), contributor to Wikipedia. Arts et Métiers station platform (métro line 11), photographer: Clicsouris (real name unknown; February 2008), from Wikimedia Commons. Arts et Métiers faux porthole - Telstar Satellite and Arts et Métiers faux porthole - Celestial Sphere and Arts et Métiers faux porthole - Hydraulic Wheel, photographer: Clicsouris (real name unknown; February 2008), from Wikimedia Commons. Sculpture of Rodin's 'The Thinker' in Varenne métro station, © Paris Tourist Office (photographer: Catherine Balet), from photo library of the Paris Convention and Visitors Bureau (PCVB). Rodin's 'The Thinker' in Varenne métro station © Perry Tak (photographer), from Flickr. Decorative tile panels in the Liège station, from Eye Prefer Paris, a blog by Richard Nahem. Art Nouveau entrance to Abbesses métro station in Montmartre (75018) (gallery of 2 photos) and Abbesses spiral staircase murals (gallery of 7 photos), © Ian C. Mills (photographer, August 2003), Discover France. Art Nouveau entrance to Porte Dauphine métro station at Place du Paraguay (75016) (gallery of 2 photos), © Paris Tourist Office (photographer: Catherine Balet), from photo library of the Paris Convention and Visitors Bureau (PCVB). Interior of a Sprague-Thomson first-class car, photo by Clicsouris, contributor to Wikimedia Commons. Météor automatic subway line 14, Gare de Lyon, train interior and station Gare de Lyon, © F. de La Mure, from Ministère des Affaires Etrangères. Météor automatic subway line 14, Paris, Catherine Balet (photographer, 2003), from the Paris Tourist Office. Sign for line 3, Pont de Levallois – Bécon station, photo by Clicsouris, contributor to the French Wikipedia. Licensed musicians playing in a Paris métro station, photographer unknown, seen on Paris Insights, originally from Discover Paris!. Espace Métro Accords headquarters on rue de Charonne, Paris, photographer unknown, from Tendances Com. Carte Orange in plastic sleeve with monthly coupon (modified by Ian Mills), Paris Visite card, Noctilien logo, student NaviGo card, and all other images of transport passes, from Régie Autonome des Transports Parisiens (RATP), Syndicat des Transports d'Île-de-France (STIF), or NaviGo. Photo booth at Les Halles station, Paris, Lionel Allorge (photographer, August 2012), from Wikimedia Commons. Mixed-use turnstile in the Paris métro by Tangopaso (photographer, real name unknown), 21 Dec. 2009, from Wikimedia Commons. NaviGo validator seen on Paris trams and buses, from Wikipedia, the Free Encyclopedia. Construction on the Paris Métro at night, rehabilitating the roadbed of a viaduct and RATP worker reconstructs an original frame section by welding gussets to the base, photographers unknown, from OTUA (Office Technique pour l'Utilisation de l'Acier), © RATP. New tunnels for the extension of Line 4 from Porte d'Orléans to Mairie de Montrouge, photographer unknown, from Urbaine de Travaux Fayat. New tunnel for the extension of Line 12 to Front Populaire station, photographer unknown, from France BTP. A work train on line 1 in the Gare de Lyon station, loaded with stone for the rail bed, photographer: Greenski (real name unknown; 15 November 2008), from Wikimedia Commons. Line 12 métro car on its side following derailment of 30 August 2000 at Notre-Dame de Lorette station, photographer unknown, from La Protection Civile de Paris. Charred remains of a Paris Métro car following a fire on line 4 at the Simplon station, 6 August 2005, photographer unknown, from Transports Urbains Français (forum), image © BEA-TT, Le Bureau d'Enquêtes sur les Accidents de Transport Terrestre (Land Transport Accident Investigation Bureau). Large crowd outside the Couronnes station awaits bodies of fire victims, boulevard de Belleville, Paris, France postcard, photographer unknown (10 August 1903), from Wikimedia Commons. Current Taxi Parisien rooftop light (green means available), photographer unknown, from Le Parisien. Current Taxi Parisien rooftop light (red means occupied), © Sébastien Soriano (photographer), from Le Figaro. Former all-white Taxi Parisien rooftop light (pre-2010), photographer unknown, from Blog Hotelaparis.com. A Parisian taxi meter, Henry Salomé (photographer; 24 August 2006), from Wikimedia Commons. Right Bank portion of Paris Métro Line 8, adapted by Ian C. Mills of Discover France, from a map at Wikimedia Commons. Ancient walls of Paris, artist unknown, from L'Art Nouveau. Paris Métro Lines 2 and 6 routes compared to the Wall of the Farmers-General, animated maps © Ian C. Mills of Discover France. Jean-Paul Belmondo in a hallmark stunt, running on the rooftop of a métro train at the Auber station, photographer unknown, from L'Internaute. Porte des Lilas transformed into Concorde station for Femmes de l'ombre film (Julie Depardieu pictured), © Thibault Grabherr (photographer), from RATP. Ominous-looking SS agents in black leather trenchcoats keep an eye on passengers at the Concorde station (in the film Femmes de l'ombre), photographer unknown, from Télérama.fr. RATP Boutique, collage of souvenirs, from Promo Métro. All Rights Reserved.